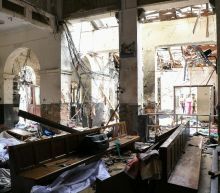 Several' Americans among 207 killed in Sri Lanka bombings A string of bombings at churches, luxury hotels and other sites on Easter Sunday killed at least 207 people, including "several" Americans, in a suspected act of terror on the South Asian island of Sri Lanka. Six nearly simultaneous explosions hit hotels and churches as worshippers gathered for Easter services in three cities, according to the Associated Press. Hours later, a blast at a guesthouse killed two people. Loved ones of a missing 15-year-old Alora Benitez held a vigil on Easter Sunday in Southern California to pray for her safe return. What happens when other countries work toward having American-style democracy? They get American-style democracy. Cartoonist Mike Thompson shows the lesson: Be careful what you wish for. President Donald Trump on Easter morning offered condolences to the people of Sri Lanka, continued his attacks on special counsel Robert Mueller's investigation and attended service at the Church of Bethesda-by-the-Sea near his Florida estate. The president tweeted happy Easter to his many followers earlier in the morning, adding "I have never been happier or more content because your Country is doing so well." But Trump followed with several others in which he sought to frame the report as his vindication, though he was clearly bothered by its details. 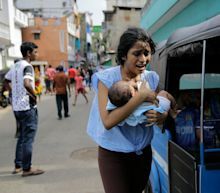 Sri Lankan officials have said the Islamist militant group National Thowheeth Jama'ath is responsible for Easter Sunday bombing attacks in the island nation that killed at least 290 people and injured 500 more. Rajitha Senaratne, the country's health minister, said the seven suicide bombers who carried out the attacks were Sri Lankan citizens affiliated with the domestic group, but that authorities suspect foreign ties as well. Very little is known about National Thowheeth Jama'ath, according to Alan Keenan, a senior Sri Lanka analyst with the International Crisis Group. Zelenskiy, 41, will take leadership of a country on the frontline of the West's standoff with Russia following Moscow's annexation of Crimea and its support for a pro-Russian insurgency in eastern Ukraine. In Sunday's second-round vote, Poroshenko, 53, had tried to rally voters, casting himself as a bulwark against Russian aggression and a champion of Ukrainian identity. 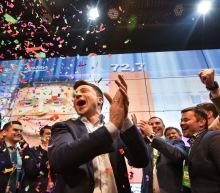 But Zelenskiy, best known for playing a fictitious president in a TV show, trounced him, winning 73 percent of the vote, central election commission data showed after over 99 percent of votes were counted.